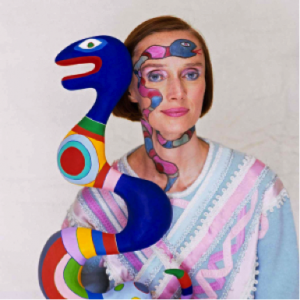 Niki de Saint Phalle, born in 1930 at Neuilly-sur-Seine, France and passed away at La Jolla, California in 2002, is an artist widely known for her artworks of various forms and media, including collages, sculptures, lithographs and films. 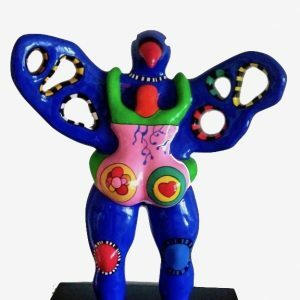 She draws inspirations for art creation from a wide range of fields such as personal life experiences, mythologies and social issues. In the early 1960s, at a time when abstract art was still prevailing in the west, Niki emerged, as an intruder, in the art field of the time, given that she had not received any formal education in art. She expands on the “shooting” paintings or tirs, assemblages of disparate objects covered with plaster that conceals containers of paint. They produce spontaneous effects and the dispersion of colors on boards when hit by a bullet. Her “target” paintings turned her famous and made her a key figure of the New Realism movement in Europe, as she is the one who leads the conceptual transition in painting and sculpture. 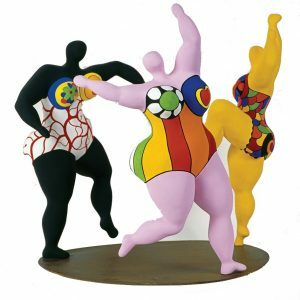 During the mid 1960s, Niki de Saint Phalle starts with Nanas, which is the most representative artworks of hers, and creates these plump and freely-posed forms one after another. Later, she produced a number of large-scale installations as well as the sculptures at the Tarot Garden in Italy. In the early 1990s, Niki immigrates to the United States and her life there serves as a blueprint for California Diary, a series of 26 lithographs.